National Night Out 2018 is scheduled for July 24, 2018 at 6-9 pm at the Valentine Family Aquatic Center. 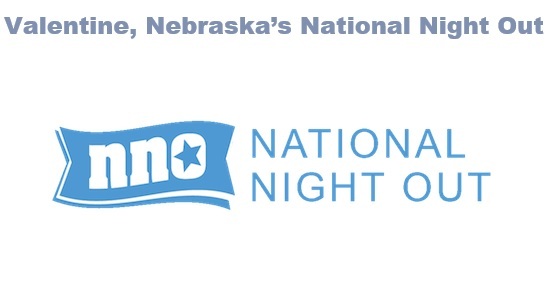 National Night Out is an annual community-building campaign that promotes police-community partnerships and community camaraderie to make our community safer and a better place to live. This is a night for Valentine to stand together and promote awareness, safety, and community unity. National Night Out showcases the vital importance of police-community partnerships and citizen involvement. When law enforcement and the community work closely together, some amazing things can happen! National Night Out is funded in part by Healthy Choices for Cherry County utilizing State Funds provided thru Region 4 Behavioral Health System and DBH. The Night will kick off with games and a free will donation supper sponsored by the Valentine Lion’s Club. Starting at 7 pm, the evening will ramp up to high gear with the annual First Responder Competition followed by an open swim, music and a general good time! If you’d like to be a part of this community event by volunteering or setting up your own game contact Valentine Police Chief Dana Miller at 402-376-3055.